The challenge is to make a card/project of encouragement or congratulations. I love this verse and remind myself of it often. In our own power and strength, we can do nothing, but when we are yielded to His will in our lives, `He gives us just what we need when we need it! Have you ever been through a terribly difficult time and thought you just couldn't make it through? But then, from somewhere, you got the strength to go on and looking back on it you realize that that strength was straight from God! I chose this sentiment from Our Daily Bread designs Grow in Grace, because it goes hand in hand with our theme this week. Whether you need encouragement to just keep moving on one step at a time, or whether you stand on the edge of a big leap of faith... He promises to give you the grace you need when you need it! In myself I can do nothing, but in Christ, I can do whatever He wants me to do! The frame I used is from Layers of Color, and is the Victorian Frame cling art stamp. I just love this frame and how perfectly it fits the Spellbinders Labels 14. 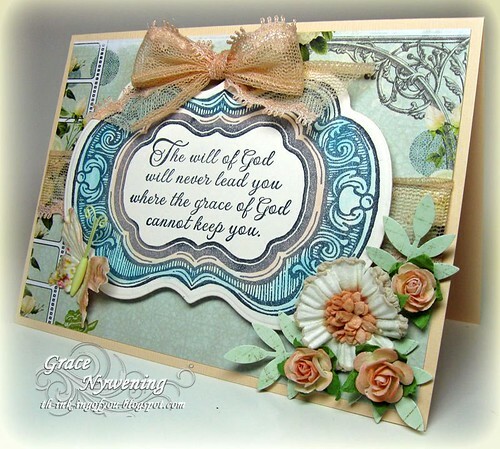 I love how it frames the sentiment from Our Daily Bread designs. I wanted a soft feminine feel to this, so I lightly chalked the frame and matted it on some pretty soft Websters pages and lace. I added Prima flowers and butterfly and punched some leaves from the Prima packaging. It was a super quick card as I had very little time to create this weekend! Our Sponsor this week is Score Pal ! We want to thank them for their generous donation and support of Stampin Sisters in Christ! Be sure to check the SSIC blog for all the prize details! Thanks for stopping and I love knowing you were here! Have a blessed week! Grace this is gorgeous! I just love this frame and those gorgeous flowers. Another beauty. You are so incredibly talented in adding details to cards - they are all so wonderfully designed. Have a great week Grace! Beautiful vintage card! Thanks for playing with Speedy's Friends! Beautiful card, so elegant. Thanks so much for joining us at CYDA this time. What a wonderful card Grace,I love the image and your papers. You certainly achieved your goal of making a lovely, vintage, feminine card! The frame is wonderful, and your use of the flowers and lace and the butterfly are amazing! I love this sentiment! It is so true, and it is such a wonderful reminder to me! Join the Fund Raiser for the American Cancer Society! Only 39 more card sets needed before December 2nd! Grace this is wonderful - love the colours and that quote is so true, as are your comments. Grase, your card is absolutely divine!!! This is such a beautiful card, Grace!...stunning really. I love everything about it, the verse, the colors, the layers, the frame, the embellishments and papers, gorgeous work, Grace! It's a perfect way to visualize this marvelous scripture! Praise GOD for His faithfulness! Sales on this stamp set went up, I'm sure your card helped! Thank you, Grace! When you visit my blog, I always feel like I have been touched by a very special person! Your heart shows through your work and God has blessed you with wonderful talent. I sense that you are in His favor. Thanks for taking the time to encourage me. Your card is beautiful, as always,in presentation and sentiment. The Victorian frame is gorgeous and I love how you featured it! Absolutely lovely ... love those pretty blooms ... thanks for joining the Fashion-themed fun at Gingersnap Creations. Wow, Grace, what a beautiful card. Fantastic! !